Recording Academy President Neil Portnow said it was "hard to have a balanced show and have everybody involved"
Recording artist Lorde and Angelo Yelich-O'Connor attends the 60th Annual GRAMMY Awards at Madison Square Garden on January 28, 2018 in New York City. Lorde didn't perform at the 2018 Grammys on Sunday and fans wanted to know why. After Sunday night's award show, Recording Academy President Neil Portnow and Grammys executive producer Ken Elrich spoke about why the Best Album nominee didn't take the stage. "These shows are always a matter of choices, and we know we have a box and the box gets full and filled up," Ehrlich told reporters, according to Billboard. "She had a great album, album of the year is a big honor, but there's no way we can really deal with everybody. Sometimes people get left out that shouldn't, but on the other hand, we did the best we can to make sure that it's a representative and balanced show." Portnow also said it's "hard to have a balanced show and have everybody involved." "Every year is different, we can't have a performance from every nominee—we have over 80 categories," he said, according to Billboard. "So we have to realize that we've got to create something that has balance, and so on and so forth. And what you saw was our best judgment of how to do that." According to Variety, Lorde was approached to perform with other artists; however, her fellow male nominees were reportedly offered solo performances. 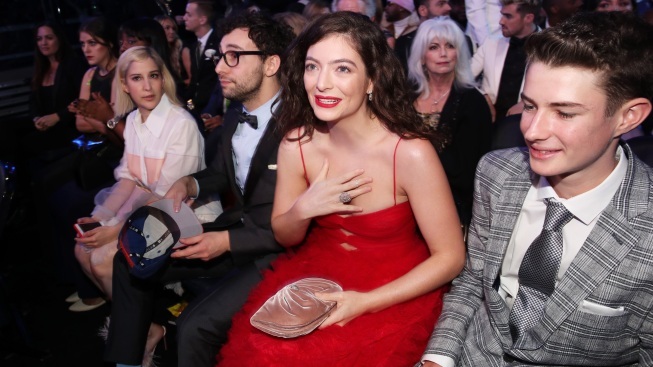 The media outlet also reported that Lorde was asked to perform as part of a tribute to Tom Petty, rather than a song from her nominated album Melodrama. While Jay-Z didn't end up taking the stage, Kendrick Lamar, Bruno Mars and Childish Gambino all performed their own music. Variety also pointed out that Lorde's mother Sonja Yelich tweeted a New York Times article that read "Of the 899 people to be nominated for Grammy awards in the past six years, only nine per cent were women." Alongside the article, she tweeted, "this says it all." Lorde still made a powerful statement at Sunday night's award show when she wore an essay on the back of her dress.